The IPM5 is a highly integrated all-CMOS single board computer with 3U form factor and fully PC/AT compatible. It is well suited for applications requiring small sized high performance PC's with great flexibility. The IPM5 is designed for a rugged operating environment and supports fully bootable Flash Disk for projects where a hard disk or floppy can not be used. All major components required to build a complete and sophisticated PC/AT system are implemented on the IPM5 board. It features an SVGA interface for flat panel and CRT (simultaneous panel and CRT operation possible), an EIDE and FDD port, one parallel and two serial ports, keyboard and mouse interface, an opto-isolated CAN interface and a real time clock and speaker. Great adaptability is given through the 16-bit PC/104 bus interface that can be used for I/O, memory and other extensions. Equipped with these options, the IPM5 only draws typically about 1A on 5V. This makes the IPM5 the ideal choice for any low-cost embedded-control applications where a fully compatible PC/AT and flexibility is needed. The AM80486-133 (AMD5X86-133) Write Back Enhanced microprocessor uses a full 32-bit architecture with floating point unit and 16kBytes of unified code and data cache memory. The instruction set includes the complete 486 microprocessor instruction set and is compatible to every member of the x86 family. Because of the processor operating frequency of 133MHz, system performance increases over a Pentium P75, while maintaining complete compatibility with the standard 486 processor architecture. The 82C465MVB chipset designed for 32-bit 486 and 586 architectures, it has an excellent memory controller and offers an up-to-date power management. Another big advantage for this chipset is the fact that OPTi offers a long term availability. Most of the chipset on the market can not guarantee this. We at MPL believe that the long term availability of a product is extremely important for our customers as changes in a product are very costly. The IPM5 is equipped with three standard 72-pin SO-DIMM sockets for DRAM and Flash Modules. 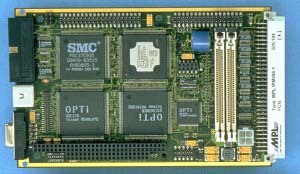 The DRAM SO-DIMM modules are available in sizes from 4 up to 64 Mbytes. Both types of DRAM (Fast Page Mode and Enhanced Data Out) are fully supported. The SO-DIMM Flash modules are available in sizes from 1 up to 16 Mbytes. The modules can be used in designs without hard disk and floppy disk due to reliability, ruggedness or space reasons. External mass storage devices such as hard disks and floppy disks can be connected to the E-IDE and FDD interfaces. The local-bus E-IDE interface supports all ANSI standard devices using PIO modes 1, 2 and 3 (two devices in master/slave configuration are supported). Five TTL I/O's are available on the IPM5. Two of them may be used as interface to digital potentiometers for software control of the panel contrast. Therefore these two I/O's are connected on the 40-pin panel header. The other three I/O’s are ESD protected and available on the 50-pin connector. The IPM5 is a true single board computer with all PC/AT features on board and therefore the use of a backplane is not needed. Nevertheless the standard PC/104 interface allows flexible extension with some additional features like Ethernet, SCSI or others (stacked on the PC/104 connector). The IPM5 is running with the well known and widely used Phoenix BIOS. The BIOS supports the flash extension for booting the flash disk. Any operating system for a PC/AT can be run on the IPM5. The IPM5 provides all aspects of quality demanded of an industrial computer system. Development according to EMC requirements support the User in achieving the CE conformity on the system level. This covers features like power saving options, on board protection/filter devices on power and I/O lines as well as a carefully designed layout.